Just another day in paradise . . . every day. 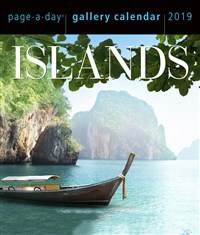 Back by popular demand, ISLANDS GALLERY is the gift of pure escape for your desktop, featuring hundreds of stunning photographs of tropical getaways. Each sun-soaked, Edenic retreat is alive with rugged beauty, white sand beaches, sparkling water, and blazing ocean sunsets to get lost in. Palm trees rustle in the breeze, and the glorious realization sets in: You are in a place that is truly apart. So, dig in your bare toes, kick back, and let the rest of the world fall away. Life doesn’t get much better than this.